An embed page gives you the possibility to add interactive content to a page. When you embed something, you show content from another website on your page. An embed-link is needed in order to use this. A piece of the other website content is shown on your own page, without moving the content. 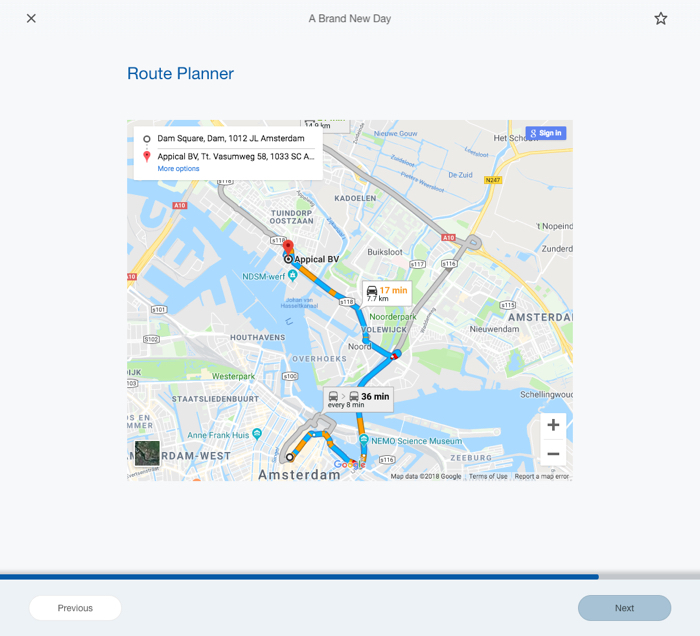 Examples are an interactive timeline, a Youtube video or a Google Maps map. There are countless possibilities. This article show a few examples that you can use in your own courses. 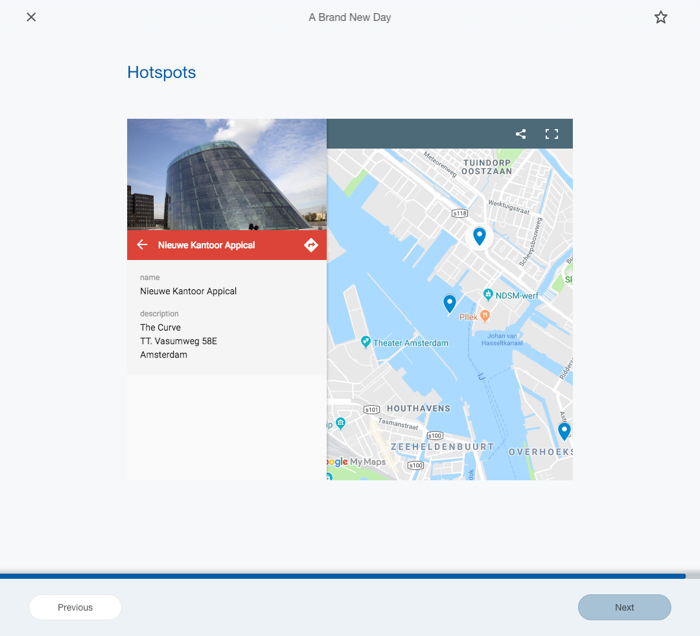 Google's My Maps allows you to create personalized maps. It's possible to add markers to these maps to highlight locations. These markers can be edited and additional information (text, pictures and even video's) can be added to these markers if needed. Google Route Planner allows you to show a pre-set route in Google Maps. This might be useful when you want to show your new hires how they can get from 'Office 1' to 'Office 2' or from the train station to the office. Yet another embed option from Google, a very cool one! Since 2010 Google let's companies hire a “Google Trusted Photographer” to come to their store or office, take a bunch of photos, and splice them together into a virtual tour. That tour is called Google Business View. 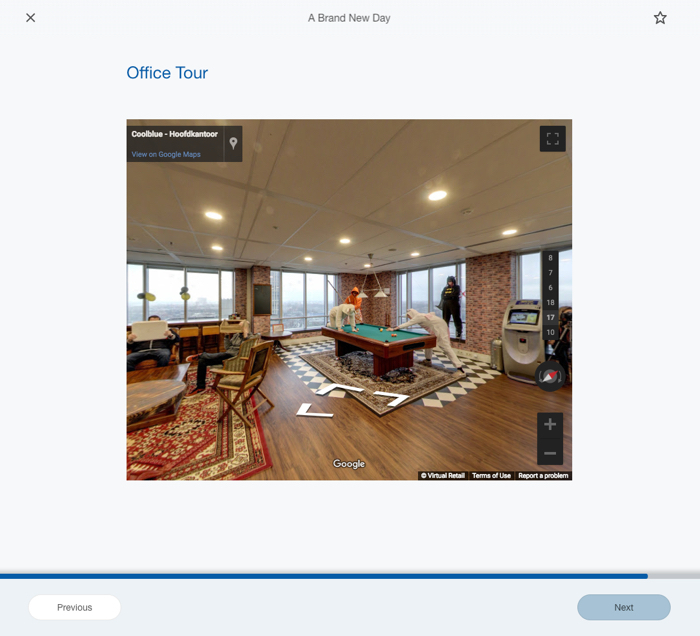 Google Business View makes it possible to create a 360-degree virtual tour of the office building so you can give your new hires a unique view of the office. Your business can have increased exposure in Google Search, Google Maps and Google+ local, with the addition of interior and exterior images with the call to action: “look inside/outside”. Of course it's possible to embed Youtube video's on an embed page. Not only video's from Youtube are embeddable, you can also embed video's from other online video platforms like Vimeo or Dailymotion for example. It's possible to give a presentation to a large audience using Prezi of share the link with your colleagues. 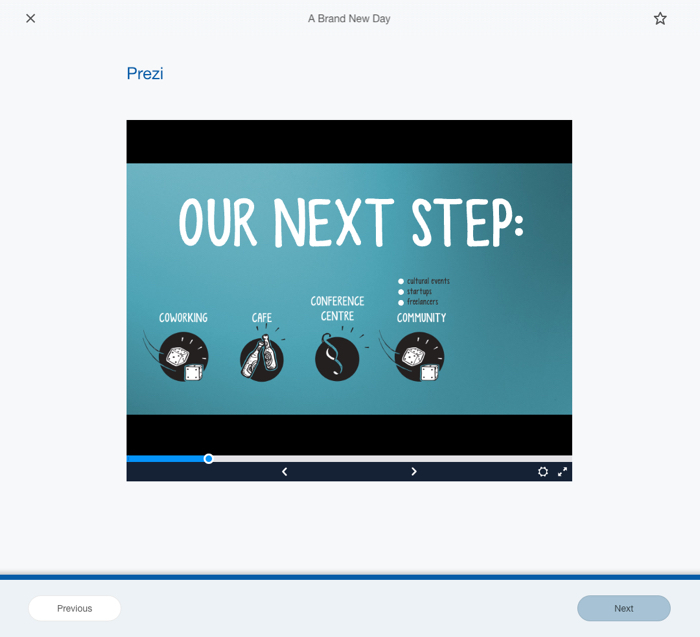 It's also possible to use an embed page to add a Prezi presentation to your AppicalNow course. 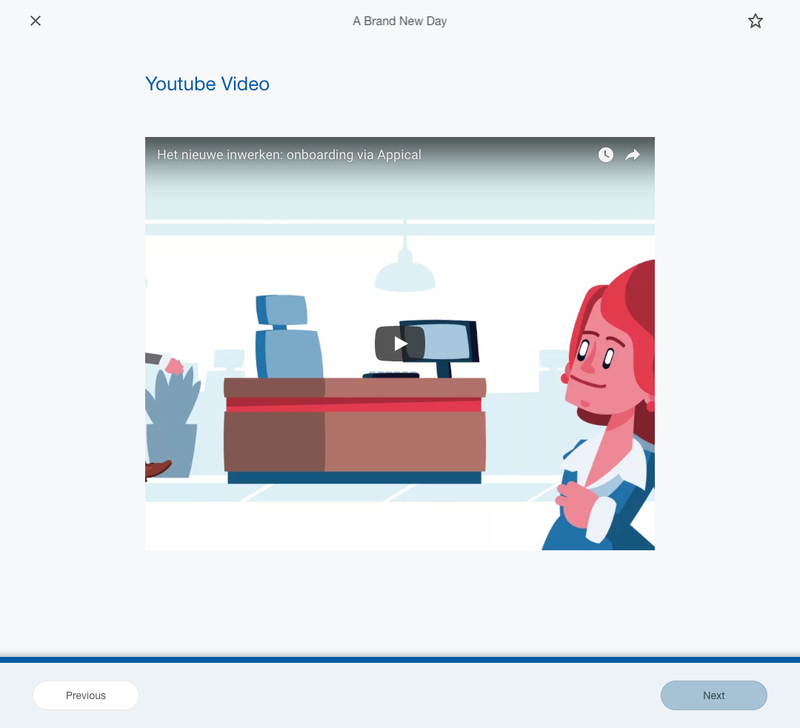 New hires can use the app to watch the presentation and navigate through it. You can explain the history of your company or product through a long wall of text of course. But why don't you do this by using an interactive timeline? Knightlab's Timeline allows you to easily create a beautiful interactive timeline with images and even Youtube video's. 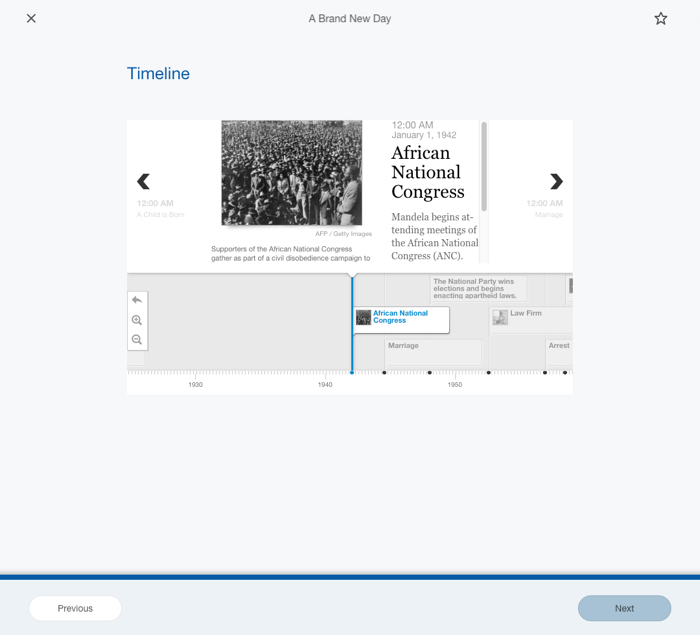 This timeline can be added to AppicalNow by using an embed page and allows your users to click through the timeline. 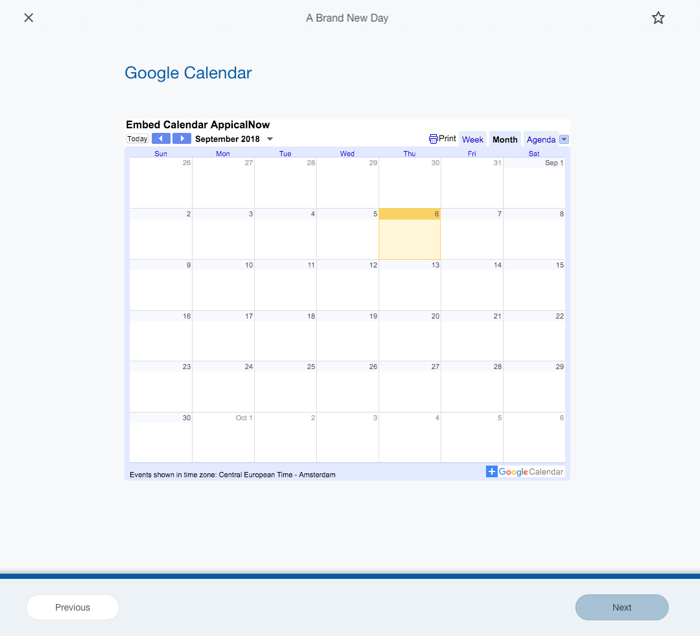 By adding a Google Calendar to AppicalNow you can give your new hires an overview of all important dates and appointments. They can add these to their own calendar with one click on their mouse too!